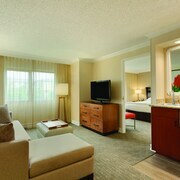 Embassy Suites by Hilton Anaheim Orange has an indoor pool, a large outdoor pool, and fitness center. WiFi is available in the lobby, and 4,004 sq feet (372 sq meters) of meeting facilities include 4 conference rooms, a fully-equipped business center provides computer, fax machine, scanner, and copier services for a fee. 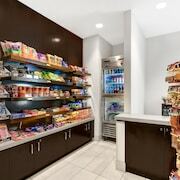 In addition to the on-site restaurant and bar, the hotel has an Atrium Market, which offers snacks, soft drinks, microwavable food, and sundries. The hotel offers a complimentary cooked-to-order breakfast each morning. Other amenities include an ATM, and a porter/bellhop. 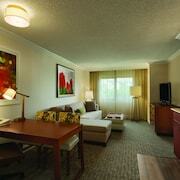 Embassy Suites by Hilton Anaheim Orange is a smoke-free property. 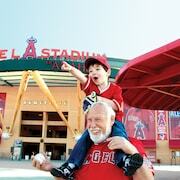 Located in Orange County, this all-suite hotel is a half-mile from Angel Stadium of Anaheim and 2.5 miles from Disneyland® Resort. Embassy Suites by Hilton Anaheim Orange offers indoor and outdoor pools, and sundeck, as well as a 10-story atrium lobby with waterfalls. 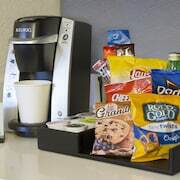 Guest suites at the Embassy Suites by Hilton Anaheim Orange have separate living rooms, wet bars with refrigerators and microwaves, and wireless Internet access (surcharge). Embassy Suites by Hilton Anaheim Orange offers 230 air-conditioned accommodations with MP3 docking stations and laptop-compatible safes. Accommodations have separate living rooms and are furnished with double sofa beds. 42-inch flat-screen televisions come with digital channels and pay movies. Refrigerators, microwaves, and coffee/tea makers are provided. Bathrooms include separate bathtubs and showers, complimentary toiletries, and hair dryers. In-room wired and wireless Internet access is available for a surcharge. Business-friendly amenities include desks, complimentary weekday newspapers, and phones. Additionally, rooms include irons/ironing boards and blackout drapes/curtains. Housekeeping is offered daily and hypo-allergenic bedding can be requested. A complimentary cooked-to-order breakfast is served each morning between 6 AM and 9:00 AM. A complimentary manager's reception is offered each day. Cloud 9 - This restaurant serves lunch, dinner, and light fare. Guests can enjoy drinks at the bar. 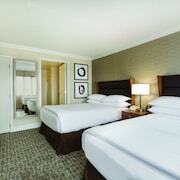 Embassy Suites by Hilton Anaheim Orange is a Disney Good Neighbor Hotel®, which allows it to sell tickets to the Disney® Anaheim attractions at the front desk. A shuttle to Disneyland picks up outside of the hotel every hour. Rollaway/extra beds are available for USD 20.0 per day.